There are two species of Demodex mites that affect humans: Demodex folliculorum and Demodex brevis. These microscopic invaders, otherwise known as eyelash mites, can make their way onto the skin and eventually wind up infecting and feeding off the oil produced by the host's hair follicles, leading to hair loss, itching and swelling. Treating a human for Demodex-mite infestation involves not only caring for the skin and hair but also other areas that harbor the mites, including pillows and pillowcases. Launder pillows and pillowcases in hot water. Remove the pillowcases from the pillows. Place the pillows and cases into the washing machine. Do not wash more than two pillows at once to avoid throwing the washing machine off balance. Add one capful mild laundry detergent and 10 drops tea tree oil. A mild detergent will contain no dyes or perfumes. Wash the pillows and pillowcases with hot water to kill the mites. Remove the items from the washing machine and place them into the dryer. 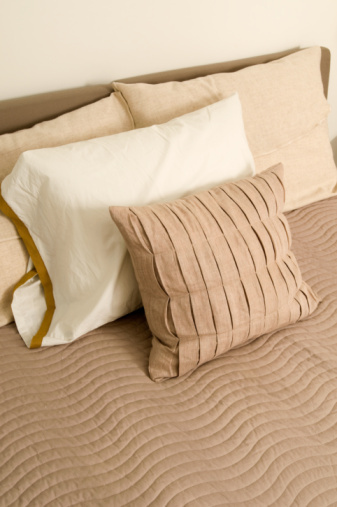 Use a lower heat setting or allow the pillow to air-dry if called for on the pillow label's cleaning instructions. Change the pillowcases every day until the Demodex-mite infestation ends. How Does a Dust Mite Infestation Occur?